OK, you’ve had it pretty easy up to now but it’s time for the test. What do the Sabre 28, Catalina 22, and J/24 have in common? Give up? They were all the successful introductory designs that launched successful boat building companies, all of which are still in business today. Although these three boats are significantly different in design and intended use, they each enjoy tremendous popularity years after production has been discontinued. 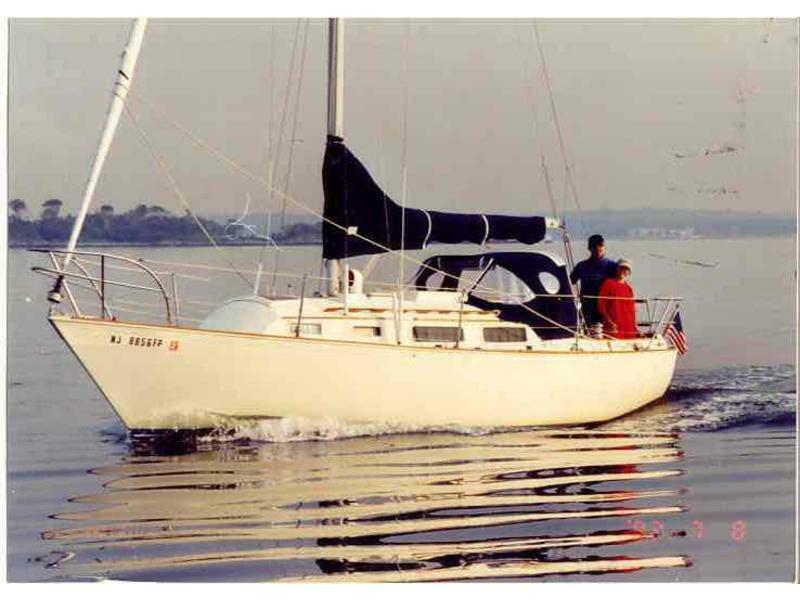 Sabre Yachts of South Casco, ME introduced the Sabre 28 in 1972. It was the only model built by Sabre built until 1977. The 28 continued production until 1986. Over the 14 years of production, three versions of the boat were offered with only slight variations from the original design. In 1975 the deck was changed to incorporate a well in the foredeck for anchor and rode storage, and the cockpit was changed to accommodate the popular wheel steering without interfering with the opening of seating arrangements. In 1984 the keel was redesigned and the height of the rig was increased slightly. The hull of the Sabre 28 is constructed of solid laminate fiberglass and polyester resin. The deck is balsa-cored for stiffness with plywood core at high stress areas such as winch mountings. The deck-to-hull joint uses an inward flange and is securely fastened with stainless steel bolts on approximately 6" centers. You will find the construction details of the Sabre 28’ among the best of any 28-foot production boat on the market. Secondary bonding and attachment of bulkheads and structural members is almost always flawless. The original Sabre 28 was built with the Universal Atomic 4 gasoline engine and, in 1975, a 10 hp Volvo diesel was offered as an option to the Atomic 4. From 1978 through 1980 the standard engine was the 13 hp MD7A Volvo marine diesel. This was replaced with the 13 hp Westerbeke diesel in 1981. The propeller and shaft were set at an angle off the centerline to either the port or starboard side of the vessel depending whether a right hand or left hand rotation engine was used. If one ever intends to re-power, it is important to keep in mind that the rotation of the engine must be the same as the original or you will encounter considerable handling difficulties under power. The Sabre 28 has accommodations for six people in two cabins with a minimum of 5’ 11" headroom throughout. There is a V-berth forward followed by an athwartship head compartment and port and starboard settees in the main saloon. The port side settee slides out to make a small double berth. There is a port side quarter berth and starboard side galley at the after end of the main saloon. The layout of the Sabre 28 is functional although somewhat cramped by the manufacturer’s attempt to cram in more accommodations than a 28’ boat can practically be expected to handle. With a relatively narrow beam, a ballast/displacement ratio of less than 40%, and a sail area/displacement ratio of 20.8 the Sabre 28 is a little more tender than her robust appearance might suggest. However, sailing performance is quite good in a variety of wind conditions when the right sail combination is used. The Sabre 28 is rigged as a masthead sloop with a deck stepped mast and single spreaders. She was originally rigged with a single upper and single lower shroud. Mast pumping was very bad and has led to some premature rigging failures on boats rigged this way. In 1975, a forward lower shroud was added to help with this problem, and all early model boats should be fitted with the additional shroud if not already done so. Weaknesses of this design include the aforementioned rigging problems on early models; an exhaust system on boats fitted with Atomic 4 engines which will almost always need replacement if original; and mild steel fuel tanks on early model boats that are prone to corrosion. The strengths are very solid construction, above average quality of finish and a contemporary style that is not so trendy as to offend the traditionalist or so traditional as to offend those inclined towards more modern design. The Sabre 28 is rather high priced for its size and accommodations; however, the boat has proven to be a good investment due to its ability to attract buyers willing to pay a little more than average for a better-than-average quality product. For a couple or a family with one or two small children in the market for a quality, mid-priced cruising boat, this is a hard one to beat.